We know life changes and, often, your banking needs have to change with it. That’s why we created Navigator Checking. This unique checking account automatically moves you between three classes so you always receive maximum benefits while keeping you away from monthly service charges. Plus, as long as you complete six transactions (Bill Pay, deposit, withdraw, purchase, etc.) in a statement cycle you will never have a monthly service charge! 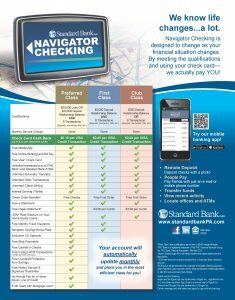 Navigator Checking has a class for everyone—whether you just use your debit card, have a loan with us or carry a large relationship balance—Navigator Checking is a great fit for you. And if your banking habits change, we’ll automatically change right with you. Plus, with Cash Back rewards, we end up paying YOU every month! Navigator Checking is ideal for seniors as it includes special Senior Benefits (ages 65+), such as free checks and free paper statements regardless of Navigator class. Your Navigator Checking account automatically comes with a free debit card that can earn you money. With Cash Back Rewards, we pay YOU every time you swipe your card. Just use your debit card as a credit, signature-based transaction, and you will receive an automatic credit (up to $12 per statement cycle) into your account. 1 Preferred Class status requires either a minimum of a $50,000 loan OR a $20,000 relationship deposit balance. In addition to these qualifiers, the account must have six transactions per month (which includes but it is not limited to direct deposits, debit card transactions, withdraws, billpays, etc.). 2 $100 bonus will be deposited into customer’s Navigator Checking account when Preferred Class has been met for three consecutive months right before or after (for new customers) loan closing. Bonus subject to Standard Bank underwriting guidelines and loan approval. Carrier message and data rates may apply for mobile app and text banking.